Large specimen pohutukawa located at roadside, easily visible from the intersection of SH3 and SH45, at the eastern end of the New Plymouth CBD. 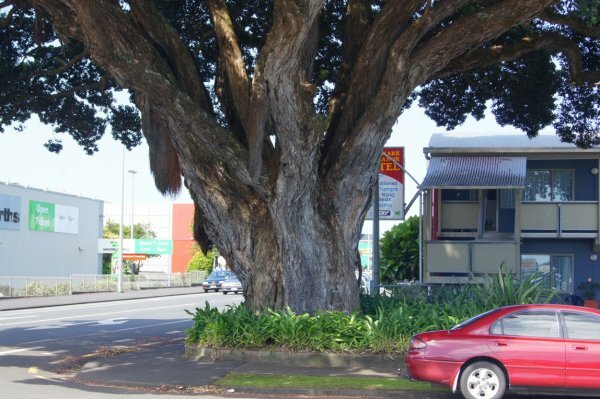 "One of the finest (cultivated) pohutukawa trees in New Zealand, the one growing at the corner of Leach and Cameron Streets, New Plymouth, will be preserved as a public asset as the result of the dedication of the land on which it stands to the Borough Council by Mr. Charles Swanson. The agreement provides that the tree may overhang the garden by 20ft. The fence of the property, which now includes the pohutukawa, will be taken round behind it and a seat will probably be provided. The tree is about 70 years old and was brought from Kawhia by Mr. Tom Mitchell, of the Armed Constabulary, who gave it to -his brother-inlaw, Mr. Thomas Inch, the owner of the property at that time. It is believed that the tree was planted about 1874. 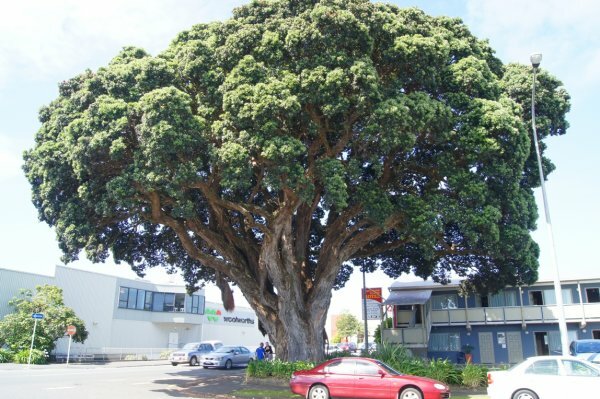 All visitors, to New Plymouth who see the tree are enthusiastic, about its beauty. It is notable not only for its size, but also for its symmetry, in which respect it is scarcely a typical pohutukawa." Very healthy, even with recent construction of an motel adjacent to tree, MJS 2011. Large, dense, symmetrical crown above 3 m tall trunk, MJS 2011. 21 Apr 2002 Smith, C.T.A & Fuller, G.
On the corner of Cameron and Leach Streets, on very small reserve set aside for the tree.